After my road trip to Bungalow 47 I couldn't wait to try out my new CeCe Caldwell paint and wax. I went way outside my comfort zone and started with Vintage White. I'm serious about being out of my comfort zone. I can't remember ever painting anything white. Oh, yeah, I forgot I painted my kitchen cabinets white last winter. They are wonderful. But I digress. I picked out a chair from my stash (I have a few stashes). This one was a $5 special from an estate sale I went to last summer. I slapped on 2 coats of CeCe Caldwell Antique White paint - which by the way paints like a dream. I didn't even sand it. I rubbed down the whole thing with a barely damp washcloth and that was all the distressing I needed. The CeCe Caldwell wax is heavenly. 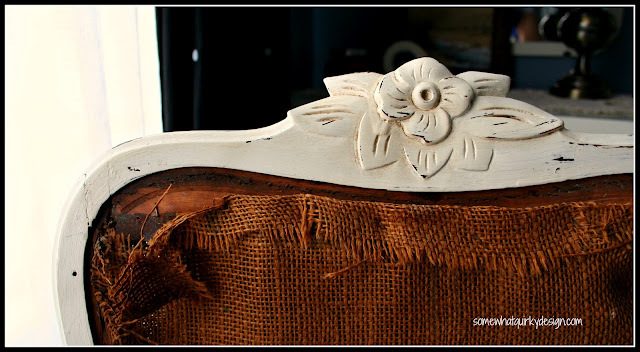 I used one coat of clear and then did a VERY light go over with Annie Sloan's dark wax. CeCe Caldwell will have dark wax available soon. I'm anxious to try it. I can't quite figure out how she will get a dark wax without chemicals - but I guess that's why I'm not the one making it! I rather like the crumbling burlap on the deconstructed chair back so I am leaving it as is for now. If I get to where I am using this chair for sitting rather than looking pretty I will have to replace it. It sheds really bad. You know how much burlap sheds? Well multiply that by 35 years - many of them apparently in a garage with no upholstery on top of it. I don't know what the eventual use of this chair will be so I didn't want to do a permanent cover on the seat. I covered a new piece of foam with some drapery lining I had laying around and made a very temporary slip cover for the seat. And I figured out something while I was trying to decide how I would cover this chair. 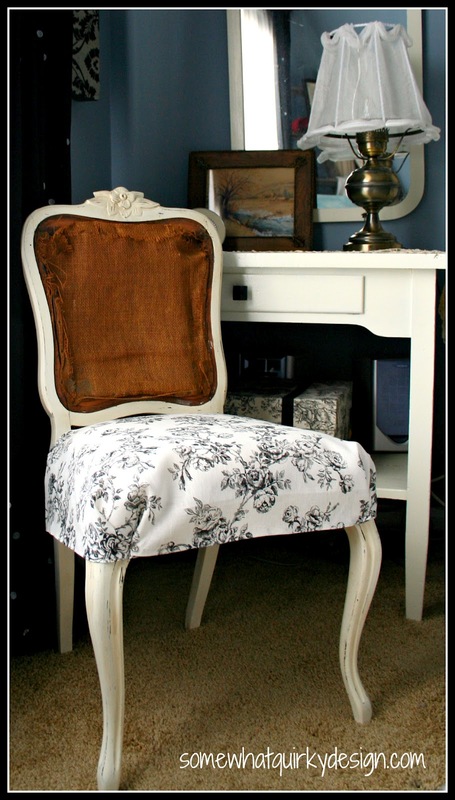 A king sized pillow sham folded in half makes a perfect seat skirt for a small sized chair like this. I guess that means you could make two covers out of one sham. Hmmm, wonder how many projects I can get from this one can of white paint???? 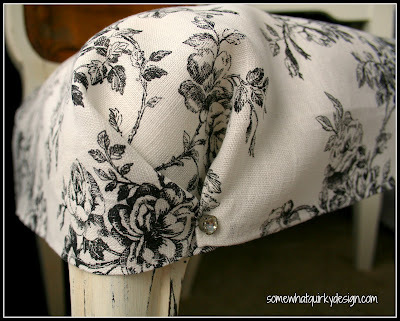 I really like that fabric, what are you planning on doing w/ it in the kitchen? A great idea for a temporary cover, and I can't wait to see what else you come up with using your new found white paint! Love this chair and now liking the idea of giving that paint a try....! love the chair,Black and White is always a great look with the blue you have,Lets keep in touch on this paint,I'm going to get the white too,my ASCP is the old white so this will give me another option. 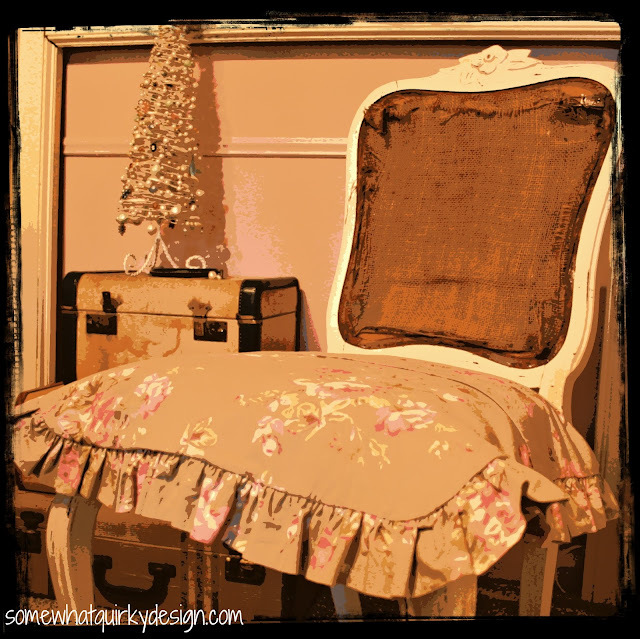 Again Love the chair and if you end up taking the old burlap off,put it in a frame and use for a mixed media family piece.I did that when redo my grandfathers chair. That turned out great! I LOVE CeCe Caldwells clear wax as well! It is dreamy!!! Cant wait for the dark wax to come out. I just ran out of my Fiddes & Sons and am trying to hold off for CeCes but not sure I can make it much longer. Thanx for linking up to THT! I've never tried this paint - it sounds great and I love your chair and the fabric slip cover. I adore everything about this chair! Especially the cover. I think I could even try this! Thanks for sharing on Show Off Saturday! love everything about this chair karen, you never cease to amaze me! I adore everything about this chair! 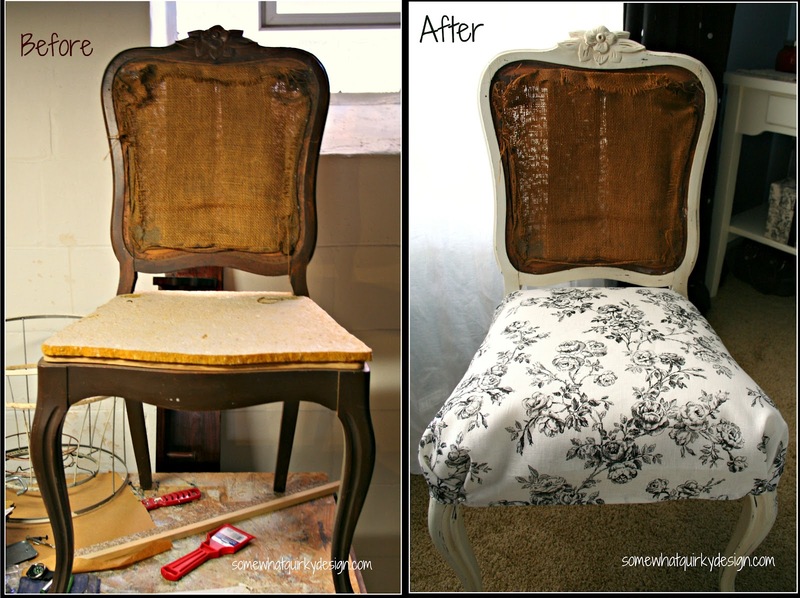 I need to paint a chair :-) I love your blog, and am your newest follower! Love this! 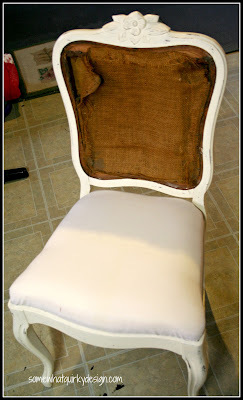 You can also dye the toile in tea and it would look a little "weathered" if you like. Love the sham idea and I have to ask where do you get the CeCe paints? Thanks for stopping by and leaving such a sweet funny comment about my ski poles. Had to laugh out loud! What a cool chair! I love how you've finished it (for now :) and your great tips. Thanks for linking up @ the Delectable Home!